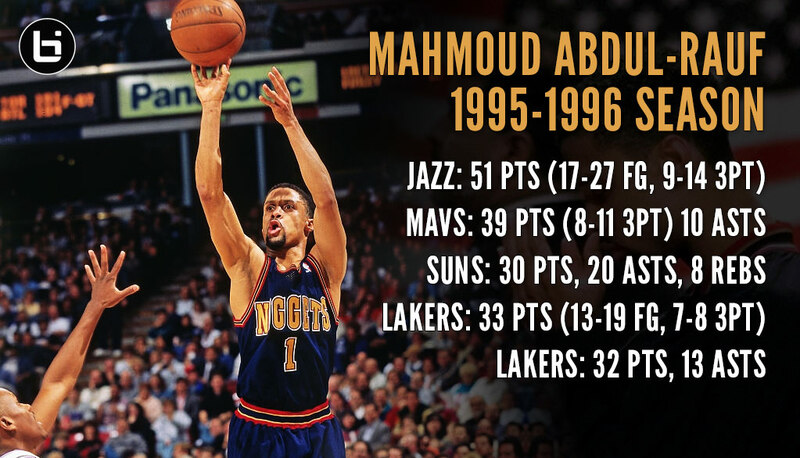 I still consider Mahmoud Abdul-Rauf (formerly Chris Jackson) to be one of the greatest college scorers and best college freshman ever. He scored 48 and 53 in the first month of his college career, 55 a month later and ended his season with the NCAA freshman scoring record. During his sophomore season, he scored 40+ 11 times and 50+ four times. I forgot to mention he also has Tourette syndrome. After being drafted by the Denver Nuggets with the third pick (behind Derrick Coleman and Gary Payton) in the 1990 NBA draft, he started his NBA career with a couple of disappointing seasons. Then he lost a few pounds, had a breakout season in 1993 and won the Most Improved Player award. But it was his controversial 1995-96 season, when he averaged a career-high 19.2 points a game and played like Chris Jackson or (this is going to piss a lot of people off) Steph Curry before Steph Curry, that I rave about the most when his name is mentioned. The season started off with a 32 & 13 game against the Lakers. He followed that up with 30 and 9 against the Spurs. Then in mid-November, he exploded for 30 points, a career-high 20 assists and 8 rebounds in a triple OT win over the Suns. It did take him 56 minutes to get those numbers and he did miss 15-of-27 attempts but it was still an exceptional and very entertaining performance. A week after this game, he put up 39 & 10 vs the Mavs and then a week after that, he blew up for 51 with nine 3-pointers in a win against John Stockton and the Jazz! Unfortunately, the only thing most people remember about this season is how it ended and pretty much ended his NBA career. If you want to know more about why it ended and the National anthem controversy then you can Google it. I just want to focus on what he did before the incident, and why I constantly bring his name up when I watch Steph Curry play.